Life lesson from Italy #2 - Some of the best restaurants look like brothels - Colette Freedman is a top Hollywood Script Doctor who has also ghost written several novels. Never judge a restaurant by its appearance. I single handedly ate my way through most of Italy and during my gastronomic journey I discovered that oftentimes the best meals were at the sketchiest looking restaurants. Sure, dining on the rooftop of the Danieli Hotel is trendy, expensive and stylish; however, the food doesn’t reflect the price tag. I should know. I reluctantly paid the exorbitant bill. The “brothel restaurants” are 1/10 the price of the Danieli restaurants. They don’t spend money on appearance, because people don’t go for the ambiance. They come for the food. 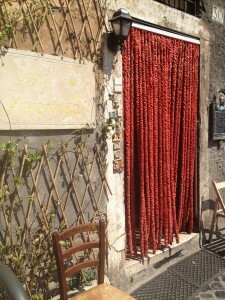 Sora Margherita, a restaurant in the Jewish Ghetto in Rome is located off of a tiny side street and has a red beaded curtain as its door. And the man behind the curtain was a ruddy faced, corpulent Italian who was as confusingly exuberant as Roberto Benigni and as intimidating as Mussolini. Yet the place was packed. They didn’t cater to tourists with a multi-language fancy menu; rather, the menu was on a piece of a yellow construction paper and the Italian dishes were written in crayon. Uber Chic? Pretty sure it was just laziness; yet, this place had come highly recommended by an Italian friend and I was not disappointed. 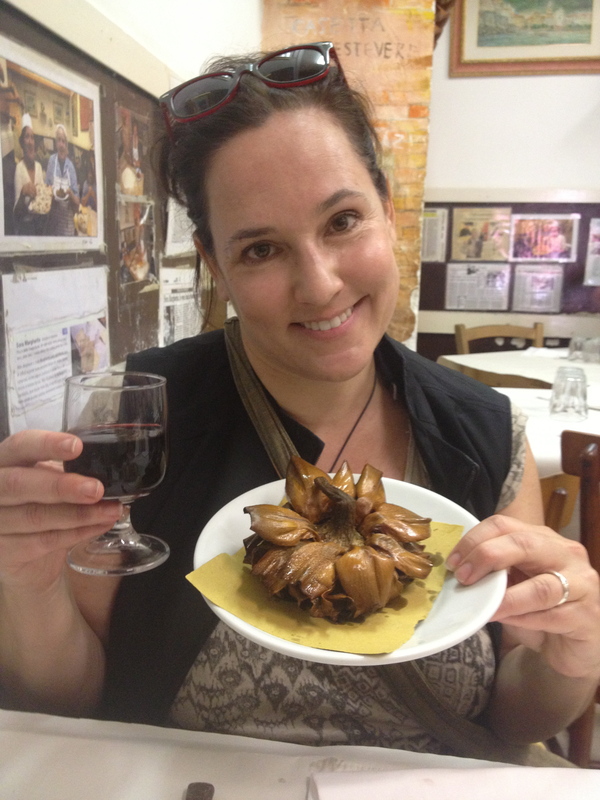 I had a carafe of Chianti and enjoyed their signature Carciofi alla Giudia…aka Jewish fried artichokes. In Venice, down another questionable side street, I discovered Osteria All’Antica Adelaide where I enjoyed one of the best meals of my life. Again, the decor was forgettable; yet, the food was remarkable. Is this the latest trend? Shabby Chic? It certainly works for home decor, but restaurants? Of NYC’s ten best restaurants of 2012, according to Zagat, nine of them have decor which ranks as high as the food. So what do the Italians know that we don’t? Maybe it’s time to pay attention to the man behind the curtain. I’m loving reading these blogs. You are my idol!